A farm has it's own spirituality that gives immense meaning and pleasure. It can't be measured in acres or the quantity of animals and crops. A farm is a spiritual thing that feeds your soul, as its spirituality pours out of every outbuilding and bale of hay. Nothing is more tangible and sensuous than a farm, and yet it is also full of spirit. 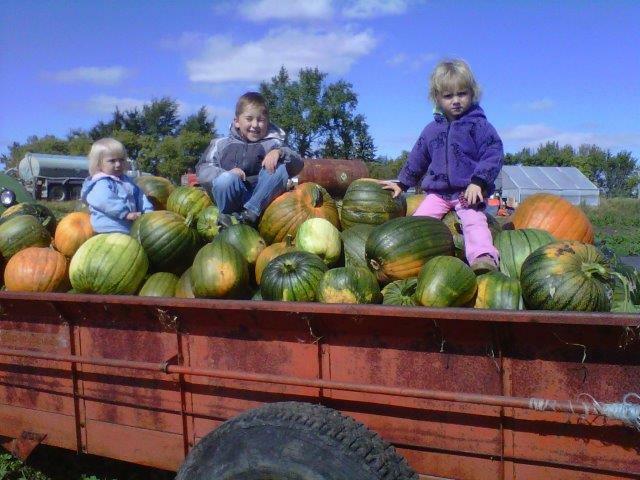 Lyle and Pam Miller, along with their children, run a small family farm in southeastern Saskatchewan We are dedicated to providing wholesome, nutritious and affordable food for families. We believe that by removing the middle man in agriculture, the customer is able to have a direct connection to agriculture and a personal relationship with their farmer. We raise cattle, sheep, pigs, goats and chickens and grow different kinds of produce, grain and forage. Our farm is reminiscent of farms from an era long gone, where you raised everything you ate, you cared for your animals, and you did it without saturating the ground with chemicals. Except for a few supplies, all of the products that we sell are grown or made on this farm. We are not a certified organic farm. We try to raise our animals and produce as naturally as possible, using no chemicals, antibiotics or hormones. We care for our animals and the environment. Our animals live on grass as long as weather permits, and the chickens are free range. We believe this makes great tasting meat and vegetables. When you buy local you are guaranteed a fresh product. Thank you for supporting our Saskatchewan family farm.